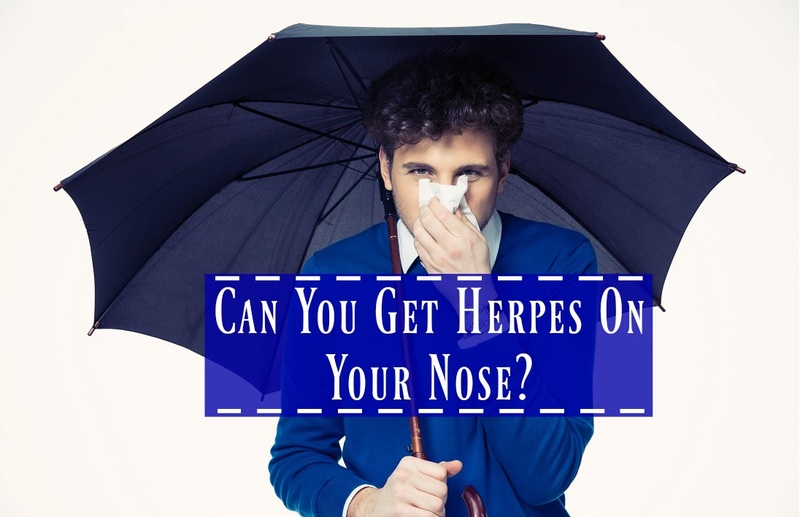 Home » Blog » Can You Get Herpes On Your Nose? Can You Get Herpes On Your Nose? HSV, more commonly referred to as herpes, is a painful and unsightly disease. It frequently causes people to miss work or skip social events because they are afraid to display their symptoms to the world. Sadly, there is no cure for herpes, but there are many methods that can reduce the severity of your symptoms and help prevent future outbreaks. HSV – herpes simplex virus – is a viral disease found in two forms: HSV-1 and HSV-2. HSV-1 is the most common, causing both facial – on the eyes, nose, and mouth – and genital outbreaks. HSV-2 is less common and causes only genital outbreaks. When HSV-1 presents on the mouth – called gingivostomatitis – sores can appear on the gums, lips, and throat. It is most common to experience herpes on the lips or the nose. How can you get herpes on the nose? Most people acquire HSV-1 under the age of 5 through physical contact with another person, but it is possible to become infected later in life as well. It is even possible for a pregnant woman to spread herpes to her child during birth if she is presenting symptoms in the birth canal at the time. This can cause a condition called neonatal herpes in which the baby develops a severe infection, causing ongoing problems in the central nervous system. Luckily, this condition is extremely rare. HSV finds its way into the outer layer of skin – the epidermis – during skin contact. The infected person does not necessarily have to be showing symptoms at the time of transmission. The virus then travels through your nerves to the trigeminal ganglion, a cluster of nerves in the area of the inner ear. The newly infected person will start to show symptoms within one to three weeks of physical contact. The virus is incurable and stays in the body for the rest of the life of the recipient, although older people tend to experience fewer outbreaks. It usually does not exhibit symptoms and only becomes active at select times. However, it is possible to spread the virus to another person even if you are not experiencing symptoms. 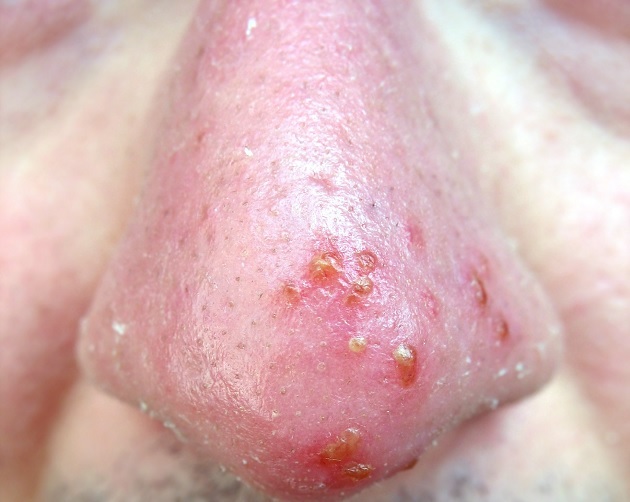 What are the symptoms of a nasal herpes simplex? When the virus is activated, it appears on the skin as blisters filled with fluid. After a time, the blisters will burst and turn into sores filled with fluid – commonly referred to as cold sores – which will eventually dry up and scab over. The entire process usually takes about 8 – 10 days, and the skin in the area will commonly heal without a scar. The infected person is contagious until all of the sores on their skin have completely scabbed over. It is important to refrain from touching the sores to prevent spreading HSV to other parts of your body or introducing bacteria to the affected area. The first outbreak of herpes is called the primary infection. Some people will not notice any serious symptoms during the primary infection, but if you feel that you might have been exposed to HSV and notice any of the symptoms above, you should see your doctor. If you have already been experiencing outbreaks and the size or severity of the sores is getting worse, have your doctor check if you have a more serious condition like HIV or pneumonia. What causes an outbreak of HSV? Although some people might not notice a direct cause of an outbreak, herpes will commonly appear during times of high stress because it is likely to activate when your immune system is compromised. Other causes include sickness, menstruation, sun exposure, and allergies (all of which reduce immune function). How can you treat HSV-1? As mentioned above, HSV is incurable. However, there are many methods of treatment that will help both prevent and soothe outbreaks. Aciclovir can be taken orally or applied externally. When you feel the beginning of an outbreak, take note of the conditions of your body and surroundings before the outbreak began. Have you been under stress? Have you been eating anything new, or the same thing you had been eating at the onset of a past outbreak? 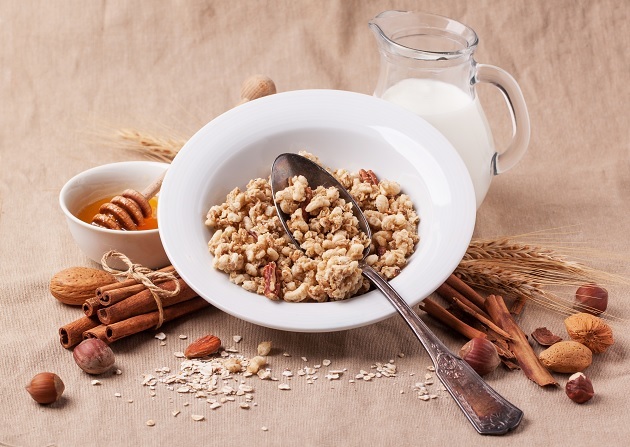 Try to draw connections between outbreaks in case you can eliminate something in your diet, habits, or environment that might reduce the frequency of your outbreaks. This is especially useful for herpes outbreaks occurring inside the nose since you can use this as a nasal rinse. Taking vitamin C regularly will help boost your immune system, making it less likely for the virus to resurface. Strawberries, green and red peppers, broccoli, and cantaloupe are some common foods that are rich in vitamin C.
Probiotics are also an excellent supplement since they promote healthy bacteria in your body which fight off the bacteria that cause various illnesses. You can find probiotic pills in many grocery stores, or simply increase your intake of healthy yogurt and cottage cheese. Since stress lowers your immune system, make sure to practice your favorite methods of reducing stress. This could be anything from singing or taking a walk to practicing yoga and meditation. A simple breathing practice that you can use anywhere is called the 4-7-8 breath: breathe in and count to 4. Breathe out and count to 8. Repeat this at least 4 times, or continue until you feel your heart-rate lower and your body relax. A great stress-reducer is a cup of warm tea and a good book. Ginger is a natural anti-inflammatory and makes for a delicious tea. Boil a few slices of ginger in a cup of water and let it steep for at least 10 minutes, or longer if you prefer a spicy tea. You can also use ginger as a topical remedy by using ground ginger and a few drops of water to create a paste, then applying it to your sores for 20 minutes or less. It will reduce any swelling that is present and also act as a natural painkiller. Finally, the chemical compound known as lysine is helpful in treating and reducing the occurrence of cold sores by directly fighting the virus inside the body. You can find supplements with lysine, or increase your dietary intake of fresh fish, beans, and cheese. Since herpes is a lifelong condition, it is important to remember that a shift in lifestyle is the most effective way to combat the symptoms and reduce the frequency of their occurrence. Most importantly, ask for help when you need it, even if you just need someone to listen to you or give you a hug. Be honest with the people you trust about your condition and let them know when it’s got you down. You don’t have to hide away, you deserve to be loved and cared for and this virus does not change that. Always remember: you are not your disease, you are you, and you deserve to be loved!